What are in our minds, if we are destined to reincarnate a thousand times to love life in misery? Ouch, even just one broken heart it feels the world is shattered. How should a thousand times, but in the suffering love life? Fall in love feels wonderful, hurt because of love? I have not heard the term that resembles it feels like to fall in love before. Perhaps because poignant and pangs, so unspeakable especially uncounted. The saddest feels if we fall in love to the wrong person. Wrong here means that not because the person is evil or rogues. Wrong here means those we love not welcome our feelings. He ignored and even occasionally shows dislike to us. The heart sense wanted to argue, but it cannot. In the end, we just reap the pain in disappointment. Has already equally in love, but no to an obstacle in the form of religion. I once wrote in full in my previous article titled "Love but different religion". Do not ask what kind of suffering. 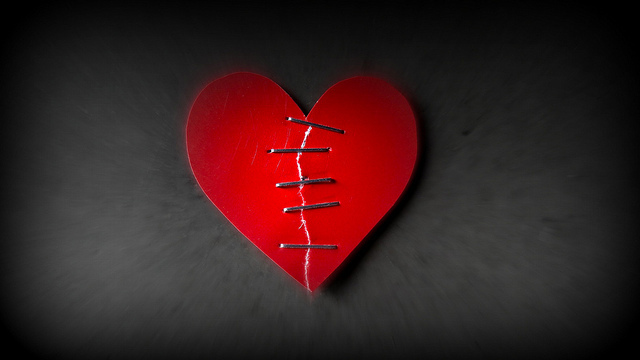 If anyone among you ever experienced, can certainly feel the pain of a broken heart. Have you ever imagined how it feels? Ancient love story could be one example. How not suffer if the lover must marry someone who is not in love. Being betrayed, it feels definitely sick for mercy. Often we think that our partner is faithful type. But, when in fact we find that our partner has the ideal figure besides us, the taste of sweet honey can suddenly become bitter poison of insects. Life feels empty because we are so miserable. Like what, for example? Forbidden love usually occurs in two human beings who love each other, but could not be together because of circumstances. It was happening because of an incestuous relationship between the sister and older brother or father to a biological daughter for example. It could also be due to the status of a loved one is not alone anymore. Deep inside said that it is not worth to maintain such relationship, but what to say there is vibration expressed the love between this couple. Broken heart makes a lot of misery and all the impossibility will continue to disturb our mind and certainly awful. The wedding day is in sight, suddenly had to fall apart because of many causes. For example: the couple had discovered the affair a few days before D-day, doubts come suddenly, the family who suddenly do not agree because the prospective husband or wife apparently getting caught is a not good, and so on. I think this is the part of the exam at the same time become tremendous anguish because anyone who had planned on getting married usually has 100% love and want to spend life with the person we have chosen. Do not ask what it was when we left to go on forever with those we love? My mother is shocked when my father passes away. No one will be able to replace the figure until whenever. Official website wooden engagement ring.